There are things we have come to expect from sequels, especially ones such as "Men in Black 2", where the end of the original left next to no open possibilities that would facilitate the need for a second one. We know it will be Hollywood trying to cash in on a popular franchise (then again, what did you think "Spider-Man" was?) We know that original ideas will run thin, so one should look for something more like a remake more than a continuation of the story. Once we have gotten past the fact that there is really no reason for "Men in Black 2" to exist, it's still hard to accept it as even mild entertainment unless one is a very lighthearted mood. Luckily, I was. Writing a synopsis of this film is almost futile; what I really feel like I should be doing is telling you to just think of the plot of the first film. Nevertheless, Will Smith is back as Agent J, part of the top-secret "Men in Black " who regulate the activities of aliens coming to and going from Earth. He's gaining notoriety for constantly neurolizing (read: brainwashing) all of his new partners. However, a troubling new case has just come up: an alien named Serleena (Lara Flynn Boyle) has come to Earth to capture a stone that could mean the end of the universe. Only one agent could really help J with a problem so huge: Agent K (Tommy Lee Jones), who has long since retired from the service. Agent J needs to bring him back up to speed so the two can save the planet once again. If you've seen the original "Men in Black", you would realize that the above synopsis resembles an exact clone of that film. You would be absolutely correct. "Men in Black 2" represents the process Hollywood has been going through since the early 90's, taking popular movies, repackaging them, extracting a little bit of thought from some director out there, and spitting it out touting it as a sequel. So what? This is nothing new. Even the most casual moviegoer has been aware of this for quite some time. 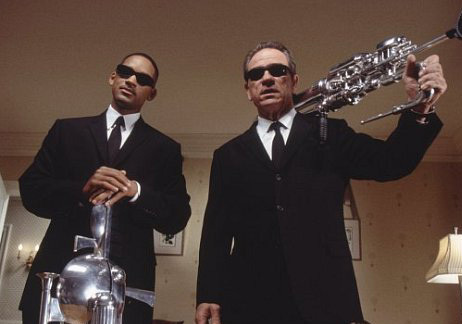 But in "Men in Black 2", there isn't even the usual sequel promise of old friends in crazy new situations. It's the EXACT. SAME. THING. What you will get, however, is more. More special effects, more aliens, more huge set pieces. This does make for something a little more pleasing than your average bottom-of-the-barrel sequel trash. One gets to see more of some of the small characters that amused but didn't get much screen time in the first film (such as the dog, which I liked). While this can help the film slide down a little easier and actually provide some laughs, it gets to the point where we see too much of them, and not enough chemistry between the main characters which we know and love. As I said before, I saw "Men in Black 2" in a lighthearted mood. I knew there were other, better films out there, but sometimes, one is just in the mood for some crappy entertainment. That's just what I got, no more, no less. Still, even though I was having a generally good time, it's very disconcerting to see Hollywood studios pulling the same old stunts while the creative team just sits back and watches. If one is commissioned to direct an utterly pointless movie, why not have fun with it? Why not do just a little more than play the same song over again? "Men in Black 2" is rated PG-13 for sci-fi action violence and some provocative humor.